I tried this shampoo as a sample and loved it so much I bought a full size. It seemed to really give amazing shine and bounce to my fine hair, which was a little tired but not really damaged. However, I found that when I started using it regularly, it left my hair feeling weighed down and even a bit greasy. I then realized that I tried the sample during a period when I was swimming a lot. My conclusion is that it is a wonderful shampoo for hair that is damaged or under environmental stress but too heavy for daily use if you have relatively healthy (and not dry) hair. It seems unfair to give it only 4 stars when it basically functions as intended, but it was more of a 4 star experience for me personally! I really love the product line in general and am sure I’ll find the right shampoo for me! I have never in my life used a shampoo that is so moisturizing that I do not need to use a conditioner with it which is crazy. I use this daily and love it! It is a must have for me! FINALLY. A shampoo that doesn’t strip the hair of moisture. I have dry hair and have been thinking about trying something like a cleansing milk shampoo for a while now. So glad I decided to try this! Helps hair retain moisture but also makes my hair feel clean even when I have a coconut oil masque in that I am trying to wash out. I absolutely love this shampoo! The scent is amazing and remains even after using a different scented conditioner. At 50, it’s really nice to still receive compliments on my hair! I love this product! It works very well for me, is high quality and I love the smell!!!! I have dry hair and this is fabulous. After using, my hair is softer, very manageable and not at all weighed down. The scent is an added bonus, not too heavy, but just right. I have been using this shampoo for about 5 years and this is one of the best product in the world. I use it when I need my hair to look luxurious and I do not have much time for extra care after shampooing. This one makes job for all. It’s quite pricey but since it alone does a great job it definitely worth such money. This shampoo has revived my damged dry and color treated hair to smoother texture, soft and easy to manage, the smell luxury itself. It is really does what it says!! I saw results within the first week use. It is pricey but worth every penny. Buy it you won’t be disappointed!! An absolute must have!! I love this shampoo! Use this every day, love it forever! Absolutely wonderful! The best of the best out there and believe me, I have tried every high end hair product and Leonor Greyl beats them all. Super shiny, super soft and terrific scent. Very well spent money, truly worth it. Highly recommend. First of all, I love the product, it made my hair super smooth and soft even though I retouch my root colors every week and blow dry every day. When used with Masque Quintessence and L’Huile De Leonor Greyl it makes my hair super soft and smooth. It has no silicones which makes me happy because my hair is genuinely repaired, and it doesn’t just feel like so. Since we’re talking about this shampoo alone I just wanna say it works without conditioner. I wash my hair once and it feels like my hair has been conditioned twice, my hair feels absolutely amazing. Which means I only use Masque Quintessence once a weeek to intensely restore hair. The thing is dislike is the scent, it smells like an old lady, but it grew on me after a while and I think I like it. The tube format is obviously not helping at all because even though I understand they package it in a tube to indicate a richness of a formula, the formula itself is extremely liquid and I lost a good portion of it after opening the cap downwards. I recommend flipping the bottle upside down then opening the cap. Until then, I hope Leonor Greyl considers repackaging it. I wouldn’t let it lose a star for the packaging and the scent, because that wouldn’t do this shampoo justice. It saved my hair. My hair was thin, dry, frizzle, and brittle after dying and highlighting. I have been using the Reviviscence shampoo for over a month now and the results is amazing! My hair has regained natural shine and looks much healthier. I will definitely recommend it. I got the sample and LOVED the shampoo! I own many different Leonor Greyl products but this shampoo is truly special. It leaves my hair soft, shiny, non-frizzy, and reduces the need for masques (I mix the amaranth and jasmine masques). I use Reviviscence as a second shampoo, after I first use the TS shampoo since I have an oily sensitive scalp and dry, fine, colored hair. I will now get a full-size Reviviscence. It is superb! This is the only shampoo I need especially in the summer when my hair is subjected to the sun and humidity. Highly recommend it. The best hair and body care line I have found and have been using it for years and my husband as well. Absolutely love this product! My hair was in a horrible state after getting damaged from to many hair dyes and them a disastrous perm that completely fried it. After using this product I could immediately tell the difference in my hair; the softness in it and the brittleness is already starting to go away! Not to mention my husband commented on how much he loved the smell as soon as I got close to him! As someone who usually stays on the cheaper end of things, I am definitely making the exception with this and will be sticking to Lenor Greyl for all my hair products needs from now on! Love, Love LOVE Leonor Greyl products. I first tried the samples from Saks in Palm Beach. The smell, the shine everything about these products are wonderful. I live on the west coast of Fl. and found it very hard to find in a department store, so I went ahead and ordered online and purchased Reviviscence, crème Régénéaratrice, crème de soin à l’amarante and purchased for my husband the shampooing au miel. I wanted to order more products for my husband but some were sold out. So, I will keep an eye out for future orders. Needless to say…Leonor Greyl is the best out there and I’ve always used quality products for my skin as well as my hair. This is definitely an upgrade that I needed for some time! Thank you!!! My gray dull frizzy hair has become youthful looking again after using the shampoo for several months. It is shiny and pliable, not so frizzy! Wonderful product! Oh did I mention I am 65 years old! Does this shampoo contain sulfates? Yes, our products do contain sulfates, but there are many different kinds of sulfates. Our products do not contain SLS (sodium laurel sulfates), which is the one that gets the most attention for being harsh and aggressive on the hair/scalp. This is my favorite shampoo. My hair truly feels healthier than it has in a long time. I would recommend this shampoo to anyone. It has completely transformed my hair. I first tried this in Hong Kong at a hair salon, after that, I fell in love. This shampoo smells wonderful and my hair feels super clean after the wash. You don’t even Need to use much, it foams well with added water. My hair comes out shiny, refreshed and smelling Good. I recommend this product to Anyone. This is the only shampoo that is effective for my colored, dry, frizzy hair, and I tried almost everything. Reviviscence makes my hair very soft and manageable every time I use it. This shampoo is amazing. Clean hair to a whole new level. I promise once you try it, you won’t want to use anything else. I LOVE this shampoo. 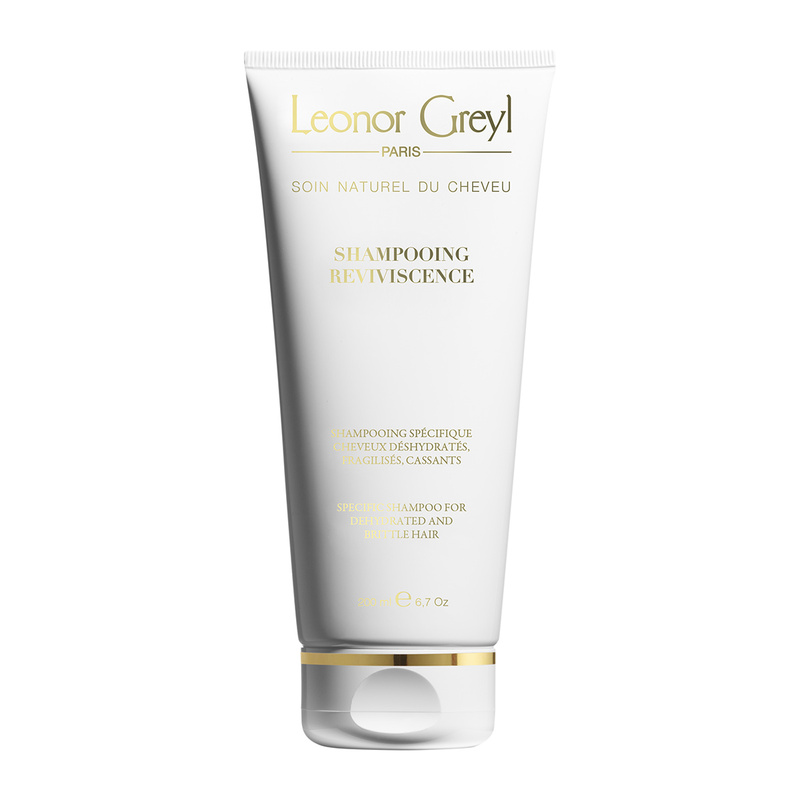 I went back to the shampoo I was using before from another luxury hair brand, and immediately came right back to Leonor Greyl. This shampoo smells amazing, and it foams which is hard to find in a natural shampoo (I prefer a foaming shampoo). It leaves my hair moisturized and soft, but not weighed down. Highly recommend this product. This shampoo is nothing short of a miracle. My hair had become dry and brittle from frequent coloring, and this shampoo transformed it after the first application. I can hardly believe the difference. The shine and softness of my hair today is now similar to that of my four-year-old daughter’s hair — which, obviously, has never been damaged by dye or heat. I wish I had discovered this shampoo years ago! It is expensive, but it is sure to last a long time if one follows the directions for application and is well worth the cost to restore beauty to damaged hair. I’m in love with this product. The scent is amazing, but more importantly is what it does to your hair. It’s magic. My dry, brittle hair was transformed after a week of using this shampoo. I can’t explain it because I sure don’t get results like this from other brands that claim to do the same thing. Leonor Greyl really got this one right! Worth every penny! My hair had been through a lot – coloring, straightening, blow drying, etc. And you could tell. It was so frustrating to keep trying new shampoos and not see a difference with any of them. Until I tried this one! After one shampoo I see an immediate difference – my hair was soft, and felt luxurious – without feeling weighed down or feeling like it was coated with product. I got a compliment from my husband that same day. I can’t say enough about this shampoo. I know it’s pricey, but in my opinion it’s worth it! I have worked with Leonor Greyl products for as long as I can remember. I value their high quality, technical performance and nature-oriented approach. They embraced organic ethos from the very beginning. Plus they smell fantastic! Whenever I use the products during photo shoots or backstage at fashion shows, the feedback is always excellent. These products serve a dual purpose – they create beautiful styles but also nourish and protect the hair at the same time. Voila! Apply to wet hair and emulsify using small amounts of water. When a gentle lather builds, rinse thoroughly. We recommend the application of pre-shampoo treatment prior to shampooing to help detangle and nourish hair. Observing how continuous blow-drys and coloring can damage the hair, making it dull and lifeless, Tom Brooks created this unique shampoo designed to replenish the most fragile hair in 2009. In the same line as the luxurious Masque Quintessence, Shampooing Reviviscence is an instant repair shampoo full of ultra-restorative natural extracts to treat the most damaged hair to a revitalizing blast. The multi-award-winning shampoo encapsulates all the brand’s botanical and formulation expertise.